Taken from Approximately 28m in the air from the cage of the Aerial Ladder Platform last week. 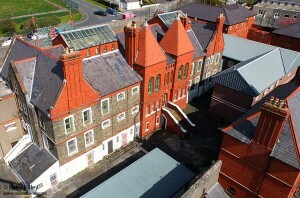 In August 2008 this beautifully designed Victorian building was vacated and the staff and inmates were all transferred to the new Isle of Man Prison in Jurby which is now fully operational. This type of architecture will probably never be seen again on the Isle of Man. I love the red paint. What is the building used for now? Eleanor they are all red glazed bricks I think! The building is falling into a bit of disrepair and is now unoccupied. Another fond memory! I remember my mum asking my dad what the big building in the distance was. I think we were walking along Governors Road – does that fit? He replied “That’s the Queen Elizabeth Hotel”!